Do you find yourself wondering what will be the perfect gift for friends and family this Christmas? Why, a book, of course! Just for you, I’m revealing my top-secret gift list. These books deserve a bookmark because I know our family will get a lot of mileage out of them; they will be read many times by the recipients and traded around among siblings and friends. Though I have categorized each book for a specific child, they really aren't limited to that particular age or gender. Matthew Reinhart is the creator of extraordinary works of pop-up art, including, “Star Wars: The Pop-up Guide to the Galaxy,” and the “Encyclopedia Mythologica” trilogy. They are intricately made for careful hands and are too expensive to give to your youngest readers for fear of damage. Now Reinhart has produced two books for the wee ones. The friendly pop-up spreads, moving pictures and flaps that open are a delight to young eyes. They’re far sturdier than expected and reasonably priced so you don’t cringe over their inevitable demise. 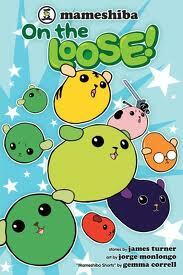 Cute and colorful, the trivia-loving Japanese “bean dog” characters in this graphic novel have a droll sense of humor. Led by brave Edamame, these intrepid legumes are off on two eccentric adventures: facing mutant sewer chickens (“terrifying monsters made of living sewage and discarded chicken parts. Plus a secret blend of herbs and spices.”), and exploring the far reaches of outer space. Though it looks like a kiddie comic, the humor is sophisticated enough for a wide audience. Star in this riotous story about learning to ski. 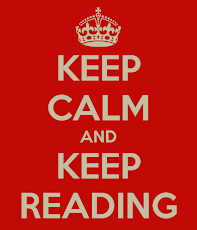 And make reading aloud a jolly good time. You’ll laugh so hard you may hurt your esophagus. Ultra nerd Julian Calendar has a plan to fit in at his new school. He’s trying to hide his super smarts to fit in with the cool and sporty crowd. When Julian fails to disguise his scientific brain in front of his class, he isn’t vilified. Instead, the “dumb jock” and the “dangerous maniac” let him in on their own big secret – they’re nuts about science, too. 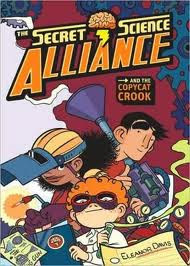 Together they form the Secret Science Alliance, soon finding themselves in a battle with the evil, invention-notebook-stealing Dr. Stringer. Eleanor Davis has created a fun graphic novel with a lively story and incredibly detailed drawings. She breaks down stereotypes and celebrates talented young minds without a hint of sermonizing. The book is so entertaining, kids will wish for more SSA adventures. 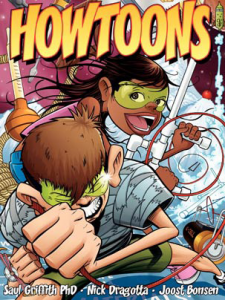 This handy comic book opens with mom’s classic query, “Can’t you kids make something other than trouble?” That’s when friends Tucker and Celine create their own workshop and go to town on some great building projects. For the cub scout who loves to use tools, this is a great gift. The book illustrates, in comic book style, step-by-step instructions for making a marshmallow shooter, a rope swing, a simple electric motor and more. Also included are lessons in safety and the proper use of tools. The projects vary in degree of difficulty. Supervision is recommended, of course. Zita and Joseph happen upon a meteoroid crater containing a device with a large red button. Though Joseph warns her not to, Zita pushes the button and, suddenly, Joseph is sucked into a vortex and disappears. Zita is horrified and can think of nothing to do except run away in fear, but guilt and worry eventually lead her back to the jumpgate and she summons the courage to follow her friend. 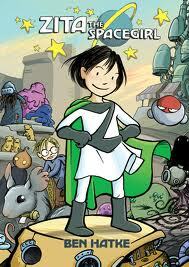 Clean design and a muted color palate make this graphic novel easy to follow and a pleasure to read. Ben Hatke has created an outer space adventure with elements that may remind you of sci-fi movies you’ve seen; that slightly familiar feeling makes Zita’s unique quest seem plausible. Zita and her companions exemplify the virtues of courage, loyalty and self-sacrifice. Readers will cheer for them. The bewitching illustrations in this fairytale graphic novel will surprise you. Yes, this is another village-versus-dragon story, but it is intelligently revisited and, as it turns out, is a compelling story. 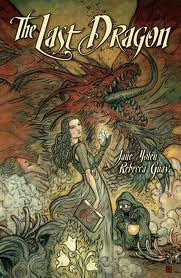 The healer’s daughter and a heroic-looking young man must use the seemingly small talents they possess to deal with the very large problem of a dragon. Though tempted to run away from their predicament, they choose the road less traveled and prepare for battle. But even with the villagers’ help, how can they possibly win? This romantic adventure has great presentation; the larger-sized hardbound tome feels somehow ancient and otherworldly. The Carpenter’s Gift: A Christmas Tale About the Rockefeller Center Tree, by David Rubel (Random House, 2011). I am always reluctant to read new holiday stories because they are so often disappointing, but this simple story gets my Bookmark. Sentimental without the sap, this story follows young Henry and his father who borrow a truck to sell Christmas trees in Manhattan where men, grateful to have work, are building Rockefeller Center. It is 1931 and times are hard. “The best presents are the ones you don’t expect,” thinks Henry. Indeed, there are many unexpected magical moments in this lovely story. The spirit of Christmas shines so brightly readers may be tempted to think it a true story. Warm illustrations sparkle with the love of family and glow with the joy of giving. Rubel’s book is a gift that will be enjoyed year after year. M. D. Clark’s family never misses the youth Christmas show at the Swift Creek Mill Theater. See ya there!